I have a sixth sense that only arises when I sit down to watch a horror movie. If my hands are sweating once the film begins then that means I’m on edge and I’ll probably be scared. Slender Man didn’t do that for me. Perhaps I wasn’t highly anticipating this movie or didn’t take the creepy pasta seriously, but it was inevitable that Slender Man would arrive on the screen, and boy is the result something quite scary. For all the creepiness that Slender Man has evoked over the years, even terrifying people in a video game, Slender Man, as a film, suffers greatly. We begin the story with a group of high school girls that hear about a couple of boys at their school who are planning to call on The Slender Man and go missing as a result. I think that’s quite comforting to actually spend time calling out a paranormal entity who people believe is somehow responsible for the disappearance of children! 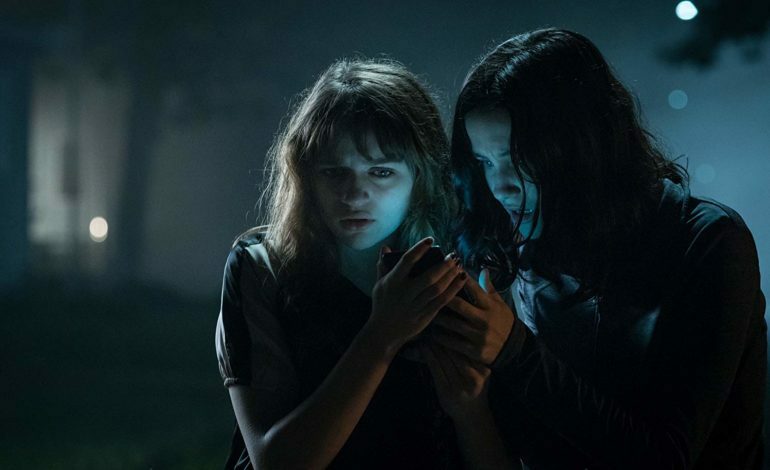 These young girls are Wren (Joey King), Hallie (Julia Goldani Telles), Chloe (Jaz Sinclair) and Katie (Annalise Basso) who watch a video that explains how to summon the demon. Ooh what mysteries await! Afterwards, the young girls experience visions and haunting dreams that could affect the reality they are in. Are they in any danger? Is Slender Man real and, if so, what are his intentions? It isn’t long until Katie disappears during a field trip and everyone is wondering what happened. You can guess as to what happens next. People are scared, people think someone is after them, everyone cries, and the audience yawns. Now, here is where I have a problem with the feature presentation. First of all, I have three main complaints. The direction is hardly understood, the script is atrocious and the camerawork is quite terrible. Every scene is dark – almost black. The scenery looks foggy and cloudy and, in all honesty, I was questioning if the theater I was in was working properly. It was, don’t worry. To make a feasible horror movie work you have to have a good villain and Slender Man isn’t one. The problem is that we don’t know who or what he is. There’s no explanation for that and yes, I know that the original concept of the character has been changed over time since his debut in 2009. Why didn’t the script examine the story further? There’s little investigation and the movie says that all missing children must be linked to this faceless character. That’s quite shocking if you ask me. The script lacks vision and scares! Another thing is odd: this movie steals ideas and tries to implement them into making this story cool. The video summoning Slender Man is clearly reminiscent of The Ring. A tree attacking a woman in a dream can be easily recalled from The Evil Dead and I counted at least five dream sequences with one sequence having a dream within a dream. Doesn’t this seem similar to Inception? Slender Man feels a lot like The Bye Bye Man which was another horror movie that lacked everything! Slender Man is going for the IT feel and suffers from creative direction, a well thought out script and terrible filmmaking at its finest! Don’t spend your money on this film, don’t even see it for free! Slender Man is marketed for the teenage audience and fails at delivering a cohesive story and most importantly, scares. Eric Knudsen (the creator of Slender Man) felt awful when the Wisconsin stabbing incident occurred when two 12-year old girls nearly killed someone because they were influenced by this make-believe entity. I can’t wait to hear what he has to say about this movie! Slender Man is boring, looks ugly and just may be the worst horror film I’ve ever seen. Save your money, your time and hopes for Halloween as Michael Myers is returning in what looks to be a promising horror flick in time for scare season!